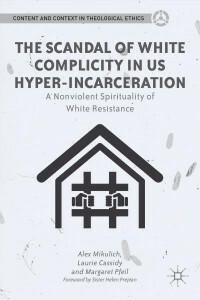 In the national Catholic magazine America I’ve just published a short review of an important new book with a long title: The Scandal of White Complicity in U.S. Hyper-Incarceration: A White Spirituality of Resistance. It’s an effort by three Catholic thinkers to articulate the depth of white complicity in this country’s massive, highly racialized prison system and to outline an approach to resistance grounded in Catholic social thought. What would a movement against mass incarceration be able to accomplish with the support of the country’s largest religious denomination? Upon recognizing the depth of the problem that mass incarceration poses, it may be tempting for many whites, especially those used to positions of influence and authority, to leap into devising solutions. Reading Michelle Alexander’s book certainly brings to mind a litany of anathemas—for instance, discriminatory policing, the senseless drug war, wildly excessive sentencing laws, the broad discretion afforded to prosecutors, the perverse incentives of the private prison industry and chronic underinvestment in communities of color. But the authors of The Scandal of White Complicity do not venture far into policy proposals or political strategizing. Nor do they allude to the many biblical passages about freeing captives that might tempt one to play the liberator. What they offer instead is a call to humility, to accountability to people of color, to solidarity. The task they set for white Americans is to organize themselves and each other as allies, and to follow the lead of their neighbors of color who are already fighting the battle against the new Jim Crow every day. Read the rest at America. One of the biggest obstacles to addressing this problem on a large scale is tribalism. We are so use to being partitioned into one group or another and we are taught to be more and more loyal to these groups because much of our significance comes from the status of the groups we are in. This pushes people to only care, and thus know about, those in their own groups. And it sparks a fear of those in other groups and that fear leads to relief when the other groups are subdued. To me, that seems to be the biggest obstacle in getting enough people to oppose the new Jim Crow. That’s an interesting way of framing the problem, but I think it only addresses part of the problem; yes, narrow tribalism exists, such as in neighborhoods where poor whites and poor blacks are competing with each other for scarce resources. But the problem Michelle Alexander outlines in The New Jim Crow is more difficult and interesting than that. It also includes the phenomenon of “colorblindness,” in which people can claim (even to themselves) to be indifferent to race, yet still support a drug war and law-and-order policies that they think are for the common good but which, as a result of a number of factors, result in drastic and counterproductive consequences for very particular communities. This system feeds off of plausible deniability, which is why the challenge that the authors of this book take up is not simply to cure whites of their racism, but to cure them of their denial that such racism exists and is perpetrating violence on a massive scale all around them. We would perhaps even be lucky if our problem were really as straightforward and up-front as tribalism. My comments were meant to address part of the problem. That part is the apathy that many Whites have toward the new Jim Crow problem. Granted that I come from a Christian Fundamentalist community and so what I described definitely fits that community; but I think we can fairly generalize here. I’ve seen Michelle Alexander on TV but have not had a chance to read her book. As someone formerly incarcerated, I don’t know what to make of this whole “Stop Mass Incarceration Movement”. What I think people are missing in this “movement” is, the majority of people in prison are there for a REASON. People have a choice, and if you make the wrong choices you can’t suddenly cry foul. It’s so easy for Black intellectuals to blame “the system” instead of admitting it’s more about personal responsibility. I come from the so-called “hood” born and raised in a housing projects in Brooklyn NY. There was gangs, drugs, violence, and all the other ills associated with black neighborhoods. I have heard so many people blame the environment with which one comes from for being the reason he/she becomes a statistic. And I have heard so many people own the “I’m a product of my environment” a means to dissolve themselves from taking responsibility for their life. People are a product of their choices. All my friends who grew up in my “hood” and had even worse family situation then I, didn’t all go to jail, sell drugs, rob people, break into people’s homes, become teen parents, drop out of school, need I say more. It’s a shame there are so many people in prison, but it has more to with people’s choices then anything else. Randy, thank you for your comment and your testimony. But I can speak from mine as well. I grew up in the suburbs, in a mostly white neighborhood. Many people I knew were involved with drugs, and many don’t seem to take a great deal of “responsibility for their life,” by certain standards. All of the things you describe in your litany of sins existed in my neighborhood, too. However, nobody I grew up with that I know of is in prison. We got second, third, fourth chances when we messed up. Benefits of doubts. Again and again. Human frailty and failings are everywhere, but law enforcement is selective. I admire what you have done to overcome steep odds, and to help others do the same, but I don’t think that such difficult and important work can be done to the exclusion of transforming the social structures that help make the odds so steep in the first place.